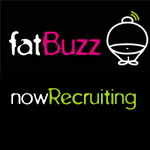 fatBuzz: Come Work for Us! We are looking for a full-time Web developer to join our expanding team. As our client list is getting fatter, we’re looking to bring in a new ‘Mac Monkey’ to our web team. We welcome interest from hard-working, enthusiastic, self-motivated, and ambitious candidates. But, more importantly, we want someone who’ll fit in with the fatBuzz ethos and is keen to be a part of our fun and bubbly team. fatBuzz is a hard working, but fun digital marketing and design agency. We work hard to ensure our clients get exactly what they want, but we work just as hard to make sure fatBuzz is a fun a friendly place to work. We want someone who will fall in love with fatBuzz just as much as we have. We work with a wide variety of clients. The role will involve working with organisations of all sizes. Our clients are mainly within the consumer, professional and charity sectors; ensuring that you’ll never get bored of doing the same thing day in, day out. The successful applicant will primarily work alongside our other ‘Mac Monkeys’, David and Jon, as well as our clients, on website design and development. You will also be required to collaborate with our Social Media team, helping set up blogs for content they’ve created. The position is based in our Glasgow office at Kinning Park. Although not essential, it would be advantageous to have a full UK driving licence. Your salary and package will be commensurate with your experience. If this position sounds like a perfect fit for you, then we welcome your CV and covering letter. In the first instance send them, along with links to any previous work, and other relevant information to kyle@fatbuzz.com. All applications will be strictly confidential.